It seems a bit ridiculous to talk about retro iPhone apps – I mean the phone has only been out for 2 and a half years but looking at this new lighter iPhone app from Bic brought late ’08 swimming back to me. The classic – though chavvy – Zippo lighter has always been one of my favourites, it’s just fun, flick the lid back, spin the wheel, move the flame. It just brings the best out of that capacitive touch screen. Okay it’s not Layar or Youtube or anything. In fact it’s not much better than iBeer: a slightly-interactive touch based app that relates to something you might have when you go down the pub, but it is fun. 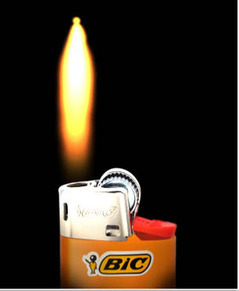 Anyway, Bic feel it’s time to recrate the old favourite but using their “iconic” Bic lighters. The app is free, the flame which ignites and flickers realistically on screen when the virtual lighter wheel is clicked.